3.9 out of 5 based on 34 bloggers and 18 commenters. 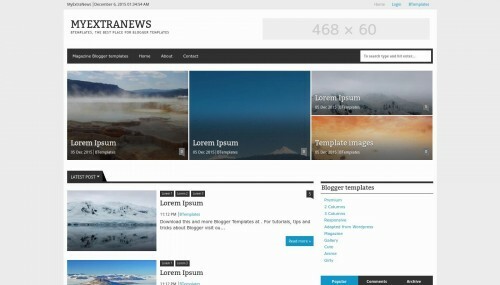 MyExtraNews is a free premium blogger template with 2 columns, responsive design, magazine-styled, right sidebar, an exclusive design for Blogger, ads ready, footer columns, slider, posts thumbnails, tabs, breadcrumbs, emoticons, infinite scrolling, related posts support, well designed threaded comments and neutral colors. Excellent template for blogs about business, entertainment, to use as a base to create your own design, movies, music, news or sports. author can teach me design menu for template MyExtraNews, please. Hi nhi! Both menus are widget that you can edit from Layout section. One is a page widget and the other one is a link widget. How to get rid od emoticons in comments form? Hello, I’m using this template right now. Can I ask how to make font in the post more bigger? Which source code that should I change? I also would like to make a post-body font-size a bit bigger. Tried finding suitable piece of code in template, but my attempts failed… could you please give answer to that question. I find this setting a bit tricky. By default it is set 11px. Change affects also titles and other things which are relative % of that font-size. They need to be adjusted separately. But in my case change from 11px to 12px did it well. Hi I’m using this template on my blog. Can you teach me how to add sub menu in the page menu widget? hi, what do i have to do for edit the post thumbnail? Hi, just wondering, but I’ve noticed after downloading this template that the recent posts widgets are no longer working. Would you happen to have a solution? Love this template, it’s works great and perfect both ini PC or mobile. Only one problem occurs, comments count show “undefined” ?? would you please Help Me…. Nice template, thank you !